Screaming rickshaw wallahs, the din of horns and grey sky greet me as I cross the road in front of New Delhi Railway Station to find myself in Paharganj. The area is teeming with street vendors, beggars, pedestrians, vehicles and dogs. And then there is the maze of alleys. No one knows how many live and work here. Paharganj is a puzzle. I am here after 35 years and it is still in a hurry but with more noise than it ever heard since its formation in the 17th century under the Mughal emperor Shah Jahan. It was among the five primary marketplaces of Shahjahanbad. The emperor had expanded the city beyond the traditional walls between 1638 and 1739, adding about 800 acres to the existing boundaries. Paharganj was then known as Shahganj or King’s marketplace. Over the centuries, the marketplace has remained but the scale of work has changed. There are no brands here, no large-scale trading, just small traders and street vendors. On the streets walk tourists on a shoestring for others prefer the glamourous and cleaner world of New Delhi. Nevertheless, it is the area where one can find food 24×7. “There is just this bazaar here, nothing else to see,” a shopkeeper tells me. No one comes here to find history but they do come for cheap kurtas, tops, junk jewellery, pots, bicycles, hookahs. Pahar literally means hill. The area got its name as it was close to Raisina Hill, where the Rashtrapati Bhawan stands. Now, the pahars are probably the ‘high rise’ matchbox homes. Time has not been kind to Paharganj. In the 18th century, this was the principal grain market. Grain was ferried across the Yamuna from markets and warehouses in Patparganj and Shahdara. Till 1947, there were major builders, cement and steel traders here. But they shifted out, renting the shops to traders like Nasir Husain. Along with his uncle, he sells musical instruments. “We are a family-run business. We came from Uttar Pradesh and we repair and sell musical instruments such as guitars and drums.” Just a few drums on the table and a pair of guitars catch my eye. “Both foreigners and Indians buy from us. These are happy drums, evolved from the Tibetan bowls and used in meditation,” he lets me try them out. They do have a happy sound. He is lucky, as his shop is near the famous Chabad House, pronounced ‘khabad’. So, there’s more chance of wares getting sold. All around are signboards in Hebrew. A policeman guards the entrance to this Israeli meeting house. This is the place where most Israelis land on arriving in Delhi. It’s the head’s day off and he doesn’t want to chat with me. A little disappointed, I ask the policeman about the place, who doesn’t know anything. So how did this bustling trading zone disintegrate into a congested market? During the British era when New Delhi was being designed, the ‘Delhi Town Planning Committee’ did include this area for development in its report dated June 13, 1912. The Chairman was George Swinton. John A Brodie and Lutyens were eminent members. But the Viceroy found the compensation for the properties too high and rejected the proposal. So, the Imperial capital became brighter and the older parts lost their sheen. Despite the dreary feel, the area grew. Even before the New Delhi Railway Station was inaugurated in 1931, the single platform near Ajmeri Gate was operational around 1926. As the station expanded operations, so did Paharganj. Eateries came up, along with hotels and more shops. Many of these shops came into existence during partition when Hindu refugees came from Pakistan. Today, every alley has a seller. I walk into one where three women are selling earthenware items. Not worried about the fragile nature of their wares, the women have spread them with ease on the road. Babli lives in the neighbourhood and her stall has pots, tawas, idols, cups, decoration pieces and more. “With the festive season picking up, more Indians buy the stuff. Foreigners come once in a while,” she gives me a curious smile. Evading a bullock cart, I watch the e-rickshaw driver waiting for customers. 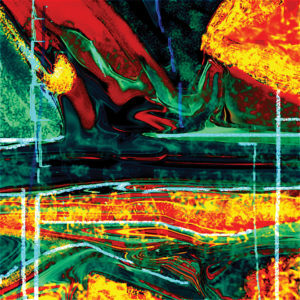 Today there’s a jam, but once there was turmoil. During the Quit India Movement in 1942, the British barracks here were attacked. The post office and five terminal tax posts were also burnt down. From being a prominent trading zone to becoming a hippie joint in the 1970s, Paharganj has seen many shades of life. Where there are rogues, there are saints too. Just before the 2010 Commonwealth Games, the area was given a facelift by the by Municipal Corporation of Delhi. 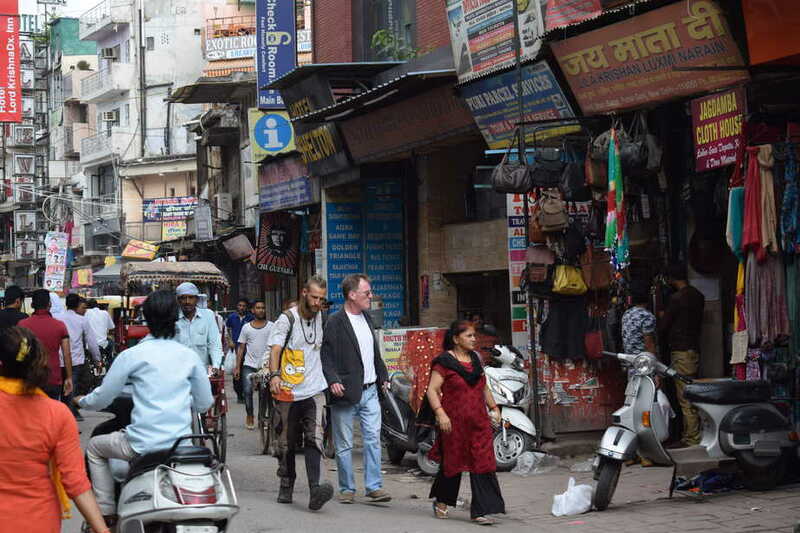 On a budget of Rs 800 million, 56 roads and lanes in Paharganj were cleaned and broadened. These housed around 500 hotels and lodges where the guests were to stay. There is the station on one side, and there’s Ramakrishna Ashram on the other side. Here, devotees worship the saint whose life revolved around Goddess Kali. And somewhere in between is Qazi Wali Masjid. This has been under scanner for a lodge runs in the premises. The mosque is famous for beautiful engravings and arched doorways. It was built in 1946 by the Sangtarashan, a family of Bandhani Muslims who were stone traders. They moved to Pakistan during the Partition. Along with life, death too resides here. The Nehru Bazar area, near Gole Market, houses the Indian Christian Cemetery where a signboard says that doubling is only allowed for family members. Keep walking and you will cross many dhabas and juice shops. I sight a couple of bakeries too. But Ritesh says the famous eateries are Exotic Rooftop Café, Tadka and Festo. At the Rooftop café one can eat Japanese and Russian dishes, besides the Israeli and Indian ones. “It’s also popular among people from South Delhi,” he emphasises. Vegetarians tend to like the food at Tadka. He adds that not many visit Sheila cinema — the theatre with Delhi’s first 70mm screen. As I walk towards the sanity of the posh Connaught Place, a little voice in my head reminds me that it is still the area where you can get food at two in the morning. TripAdvisor has listed the Salaam Baalak City Walk as one of the ways to see the area. The Trust was started by film-maker Meera Nair of Salaam Bombay fame and provides education and shelter to street children. A 17-year-old girl is our guide. Along with her senior Asif, Annie Anthony Joy has been raised in one of the shelter homes run by the trust. The aim of this walk is to sensitise people to the life of street children in India. Poverty, drugs, abuse — it takes a while to absorb the harsher side of life. While the walk is not popular with Indians, I do see two students with five foreigners. 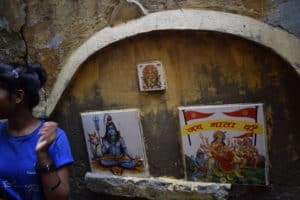 Asif and Annie take us past a wall where tiles with pictures of gods are stuck. They say that this is to prevent people from using the wall as a toilet. The journey in the maze ends at the contact centre which is also a day care for young lives.